Ffestiniog Travel are keen to help you mark this great milestone by offering a mini-break to commemorate the memorable breakthrough that occurred 75 year ago - Mallards' steam locomotive world speed record. This steam achievement took place on 3 July 1938 when the London North Eastern Railway's A4 Class locomotive Mallard raced down Stoke Bank at 126mph to set a new steam locomotive world record which still stands today. The National Railway Museum in York will be marking Mallard’s 75 year triumph in July 2013 with a series of commemorative events including a never-before-seen gathering of all six surviving A4s and Ffestiniog Travel wants you to be part of it. 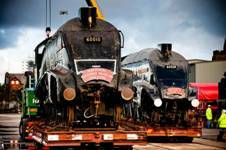 Two A4s – Dominion of Canada and Dwight D Eisenhower – have been temporarily repatriated from Canada and the US. 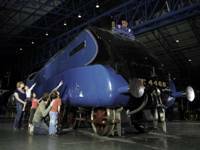 Both locomotives are being cosmetically restored in time for the anniversary celebrations, and Mallard has also been given a new coat of paint in keeping with its status as the world's fastest steam locomotive. We are running 2-night mini-breaks to York during July 2013 with prices starting from £137 per person based on two adults sharing a double or twin room with bed and breakfast included. Admission into the Railway Museum is free for all ages but the mini-break price also includes a '2 day York Pass' which gives you access to all of York’s other main attractions including the Jorvic Viking Centre, Fairfax House, the Lord Mayor's mansion and the Merchant Adventurers' Hall and much more. If you still have time, don’t miss the awe-inspiring York Minster, the largest Gothic Cathedral north of the Alps. You can also combine the trip with a visit to Castle Howard and the North Yorkshire Moors Railway or maybe a trip to Eden Camp and The Yorkshire Air Museum. Why not extend your stay to include a trip to nearby Lincoln and the 2013 RAF Waddington International Air Show, taking place on 6th and 7th July. This year's show will mark the 70th anniversary of the Dambuster raid and is the largest of all RAF air shows, regularly attended by over 125,000 visitors. The spectacular 7-hour flying display features the fabulous Red Arrows, the Battle of Britain Memorial Flight and many more military and civilian aircraft from the UK and abroad. We can also arrange rail tickets from your home station to York, please ask for a quotation. If you wish to attend the Waddington Air Show, ticket prices, including rail travel from York to Lincoln, start from £45.00 per person. Prices are subject to availability and booking early is advised. So please don’t hesitate to contact jenene.craven@ffestiniogtravel.co.uk or call 01766 772030 to discuss the various options and ensure your place at these commemorative occasions.